Loedolff House is situated at 26 Loedolf Street in the centre of Malmesbury. Take the N7 from Cape Town to Malmesbury. Take the main Malmesbury off-ramp. The road loops round bringing you onto Bokomo Road. At the major intersection (with Voortrekker Road) continue straight on. The road becomes Loedolff Street. Stay on Loedolff Street! (The route through town continues to the right- don’t follow that) Number 26 will be on your just after the Skool Street intersection. There are a number of interesting buildings in the vicinity that we will also be visiting. “This is one of the most interesting houses in Malmesbury. It was the home of Hugo Hendrik Loedolff, a local MP who played a controversial role in church circles”. He describes the front with its two doors with spoke-fanlights and the plaster window surrounds that date the house to circa 1830. He also points out that windows at the rear of the house date back to c. 1815. A flat roof wing at the back contains an even earlier flush casement and there are heavy early internal beams in this section. The gable was carefully reconstructed by Len Raymond with very little information to go on. In the 19th century, Hugo Henry Loedolff played a major role in Malmesbury and the rest of the Swartland. He was a controversial subject; a man with a sharp intellect, a formidable character with a passion for his beliefs. His strong will, determination, and accompanying firm beliefs, particularly in the structure of the church, created a storm and caused great upheaval in the Dutch Reformed Church at the time. Loedolff was born in Cape Town in 1804. He moved to Malmesbury in 1838, where he worked as a legal and estate agent. From March 1854 to 1864 he represented Malmesbury in the Cape Parliament. He was an elder in the local church and as a town deputy sat in the Synods held in Cape Town in 1857 and 1862. The controversy that Loedolff created in the church, related to his view of the composition of the Cape Synod. Following the Great Trek, the church synod consisted both of members of the Cape as well as members of churches that lay outside the Cape. 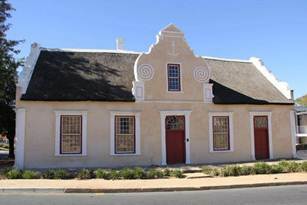 It was taken for granted that the churches outside the borders of the Cape Colony formed part of the Cape Church and therefore could be represented in the synod of the Cape Church. Loedolff vehemently opposed this concept. At the Synod of 1862 he created a sensation. On the first day of the session when the Synod was constituted and the names of the delegates were read out, he objected in writing to the representatives from Pietermaritzburg in Natal. His objection was dismissed. On 6 November, he submitted a motion that no congregation outside the borders of the Cape Colony could have a seat in the synod. He had sought legal advice from three advocates of the Cape Bar. The proposal was rejected by the Synod. Loedolff then took the matter to court. At a second court hearing to obtain an interdict he was successful and members from outside the Cape were barred from the Synod. This completely changed the composition of the DRC. At the AGM a new committee was elected: The new committee members are: Karin Strom, Bridget O’Donoghue, Joy Woodward, Pat Kramer, Marion Ellis, Kathy Dumbrell, Helen Binckes and Andre van Graan. Antonia Malan will continue to look after publications. In addition a number of members indicated their willingness to assist with Talks & Outings. Our grateful thanks go to the members of the outgoing committee for their hard work and dedication to ensure the smooth running of our society and the arrangement of the talks and outings. In particular, a big “Thank you!” to Thys Hattingh, our outgoing Chair, for his incredible input into the running of VASSA over the last five years and to Keith Loynes for the excellent book-keeping system that he has set up and maintained. At the meeting Joy Saxon was made an Honorary member in recognition of her sterling service to the Vernacs over the years. Our thanks also to Helen Binckes for her excellent organizing of the refreshments.